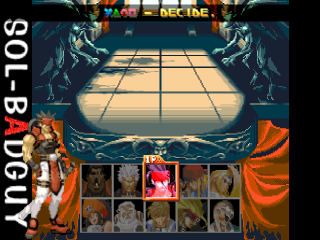 OverviewThe first game in the now vast Guilty Gear franchise of 2D fighting games. This game stood out thanks to its high resolution graphics and strange cast. 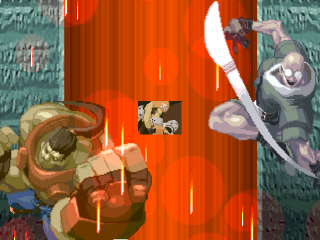 Guilty Gear is a 2D fighting game that features great art, fast music and even faster gameplay. While you can get through some of the game from just button mashing, It's almost ciritcal to familarize yourself with combos. The vs game is very fun, expecially when the single play gets hard. If you have a craving for a great fighting game, this game is definately going to suite your appetite. 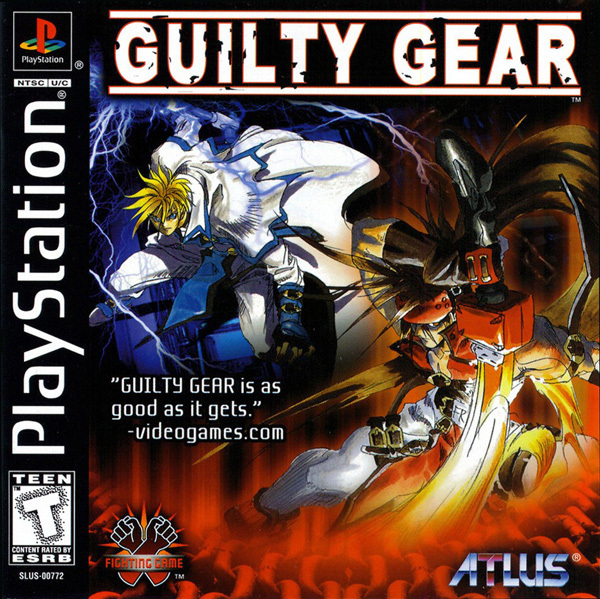 The first game in the long-running Guilty Gear series, it's a 2D fighting game with quirky, anime-style fighters. There are ten characters you can choose from, movements are fast and chaotic, and special attacks are flashy. Stage music are mostly rock or heavy metal. Each character also have an Instant Kill attack that can be performed anytime, and when landed successfully, will immediately make you win the whole match. 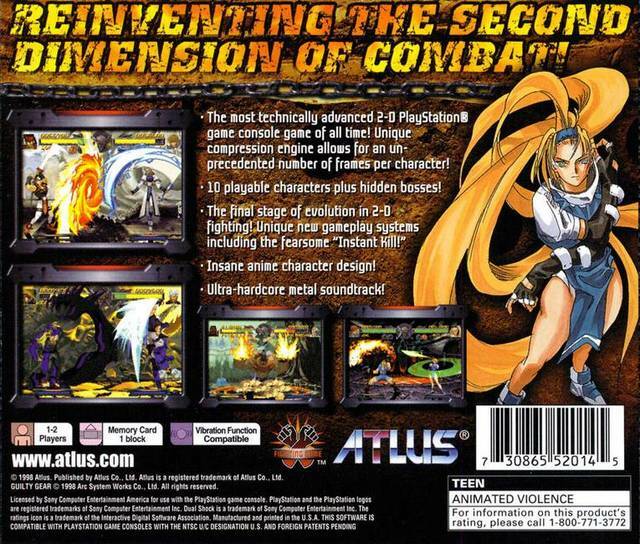 Good 2-D fighting games are hard to come by in this day of polygonal powerhouses such as PlayStation. Capcom has met with continued success, but has gone largely unchallenged in the field. 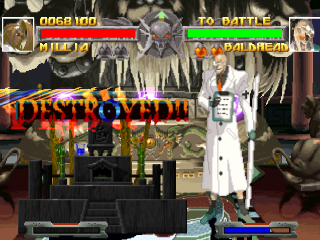 Enter the unknowns: Japanese developer Team Neo Blood, and its contribution to the annals of 2-D fighting, Guilty Gear. Released some months back in Japan, and snagged for US distribution by Atlus, it's just shy of the best the genre has to offer on PlayStation. Here's what you get. 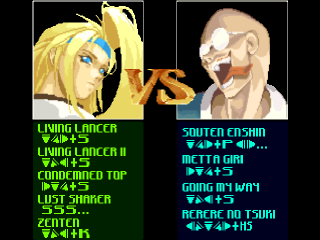 You've got your requisite fighting game modes: arcade, versus, and training. You've got 10 combatants, each possessing at least a half-dozen special moves. You've got a Samurai Shodown-style power meter that builds your character's strength as they become enraged. In addition, the game sports compatibility with the Dual Shock analog controller for producing vibrations when a solid hit is landed. Delivering a super-solid fighting engine, unrivaled animation quality, and the best characters (10 in all) outside Capcom/SNK, the game is a design marvel. Moreover, it's an absolute joy to play. Fighting doesn't get much more frantic than this either. 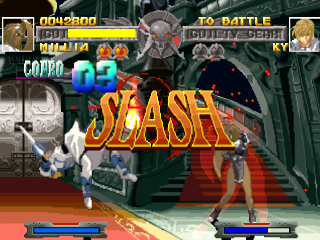 The game's combo system borders on the excessive, and gameplay speed is fast, fast, fast. But despite all the on-screen pyrotechnics and split-second reactions needed to come away alive, the game remains surprisingly balanced. It's not the most fined-tuned fighter ever (Capcom remains king in that respect), but it's better than 90% of those on the market. My two biggest gripes: some moves are simply too powerful, and the computer AI is downright fiendish. They're not enough to tarnish the game's otherwise excellent presentation however. 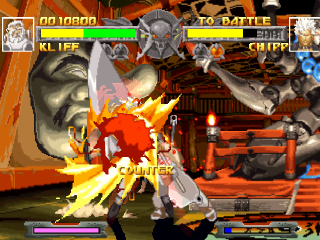 Guilty Gear may fall just short of the greats but it's still deserving of classic status. It's a wonder that such an excellent game came virtually out of nowhere. If you consider yourself a fighting connoisseur, it comes highly recommended. No true fan of the genre should be without a copy. Now you can add videos, screenshots, or other images (cover scans, disc scans, etc.) 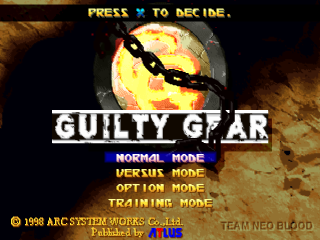 for Guilty Gear [NTSC-U] to Emuparadise. Do it now!